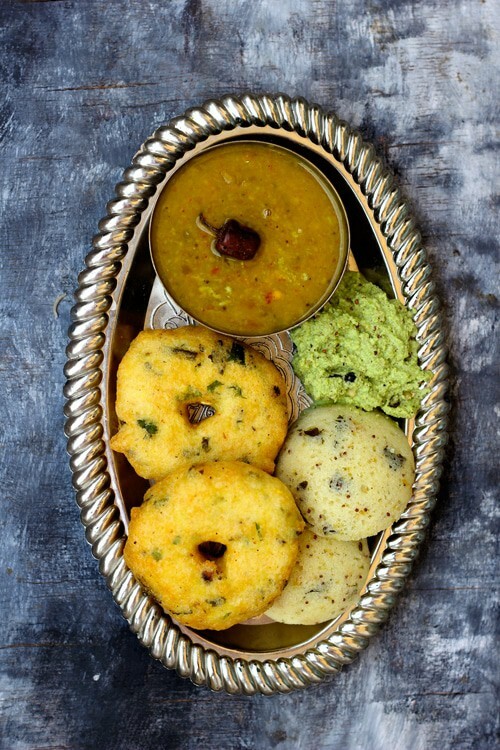 Medu Vada is a classic South Indian gluten-free vegetarian fritter. Or I should describe it as an indispensable South Indian breakfast staple. It is crisp, crunchy, fluffy and full of flavours. The soul-satisfying piping hot medu vada dipped in sambar with coconut chutney is totally an irresistible breakfast combination. As a result, you surely cannot stop at one vada. Other than Idlis and Dosas, medu vada is perhaps the most sought-after dish for lovers of South Indian food. Since, I have a large, soft corner in my heart for the typical South Indian breakfast. Medu Vada Sambar is a regular affair for breakfast or Sunday brunch. Probably you might be confused between medu vada and maddur vada. These two are entirely different versions of a vada and has a distinct preparation process. The Kumaoni Vada (Bada) is also very similar to the medu vada. The only difference between the two is – the former is prepared with split black urad dal (chilka urad) while the South Indian vada is prepared with skinned urad dal. You will be surprised to know that there is no onion/garlic/ginger added in the Kumaoni Vada. It is a kind of sattvic dish prepared in all the Kumaoni households on most of the auspicious occasions or celebrations. So these all are one or the other form of Indian style fritters equally delicious, crispy and all-time favourite teatime snacks. After all, who could resist the temptation of deep-fried fritters served with chutney and a cup of strong filter coffee? 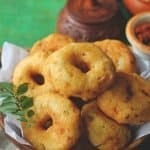 How to Serve Medu Vada? For an authentic South Indian breakfast at home, prepare – Rava Idli, Vada, Sambar, Coconut Chutney and Filter Coffee. It will be a blissful Sunday morning breakfast. While most people choose to have vada in the morning, many love to binge on it as snacks in the evening. 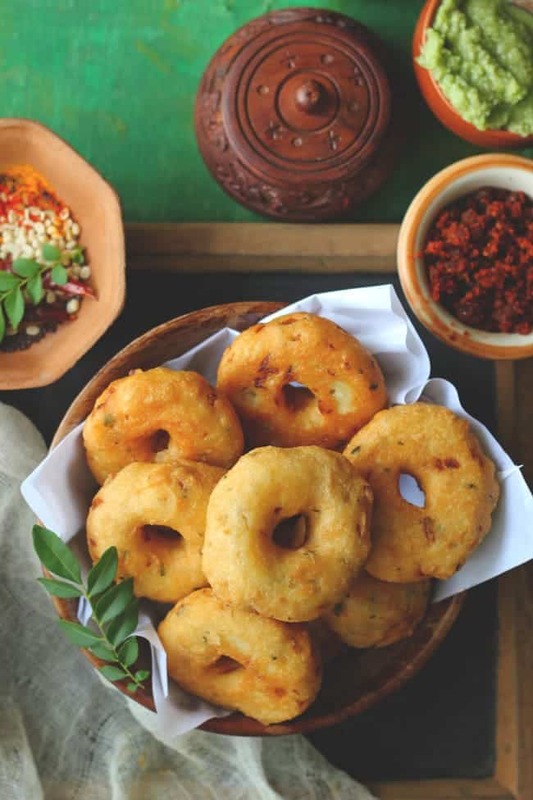 Traditionally, medu vada sambar is the most popular meal combination; however, you can also choose to savour it with a dash of slightly sweet, whipped curd or only with coconut chutney. Now let’s talk about medu vada recipe. First of all, there is no shortcut to making perfectly crispy medhu vadai. It has to be done from scratch. There are few recipes that require the love of labour and this is surely one of those. But the end result is totally worth the effort. 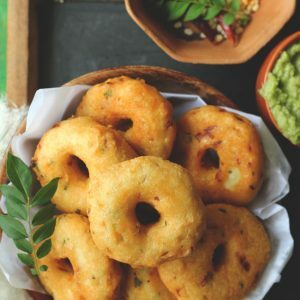 How to Make Medu Vada Crispy? Grinding the dal to the perfection is the key to making a delicious vada. Use very little water while grinding the dal. If the batter seems thick add a tablespoon of water at a time. Too much water in the batter makes it difficult to shape the vada. But don’t grind the dal for too long. Post grinding, whisk the dal for at least 10 minutes or until it is light and airy. I use my electric hand mixer for the purpose. It does the job excellently. And please make sure NOT to add salt while whisking the batter. The perfectly fluffy dal batter results in a delicious restaurant style vada. Before deep-frying, the vada, make sure the oil has reached the right temperature. I prefer frying the vada at medium heat so that it gets fully cooked from the inside as well. Wait till the vada turns golden brown from both the sides before transferring it to the plate. If the vada absorbs too much oil while deep-frying there could be two reasons for the same. One, the oil is not hot enough. Second, too much water is added while grinding the batter. Can I Use Medu Vada Maker? Nowadays, very cool looking vada maker is also available in the market. Many people find it difficult to shape the vada with a hole in the centre. The vada maker (buy it here) eases this job by pushing perfectly round vada from the machine. But personally, I have never tried vada maker. Neither does, anybody in my family. So maybe, its high time I should give it a try too and share a review about the same. Hence, vada maker can be a useful tool to create seamless vadas at home if you know how to use it correctly. If you try this medu vada recipe and love it, please leave a comment and a rating. This helps us grow and reach many other food lovers like you, who are looking for a perfect tried and tested recipe. 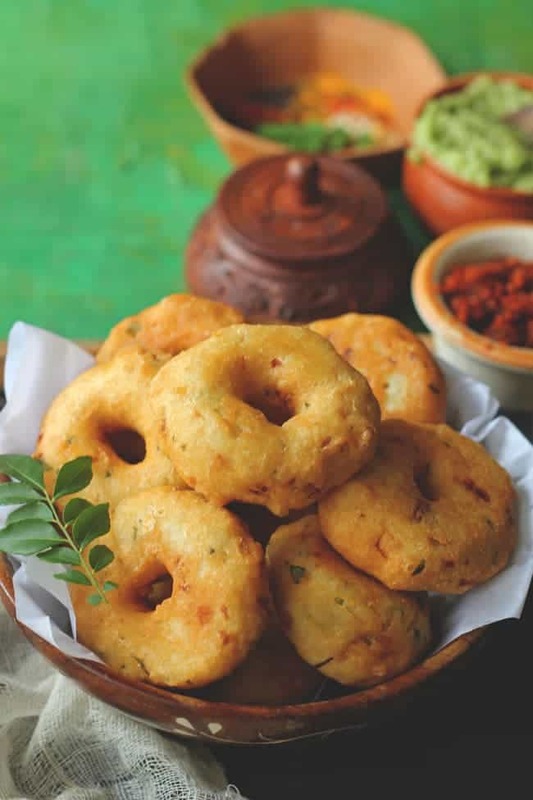 Medu Vada is a classic South Indian delicacy. It is crisp, crunchy, fluffy and full of flavours. Learn how to make South Indian style crisp medu vada at home in few simple steps. Rinse and soak the urad dal in water for 4 – 5 hours or overnight. Now grind the dal in the mixer grinder. Make sure use very little water while grinding the dal. To get the smooth paste you need to stir the dal few times while grinding. Grind, turn off the mixer, stir and then grind. Repeat the process till you get thick, smooth dal paste. Use one tablespoon of water at a time to grind the dal. Transfer the dal paste to a clean, large bowl. The trick to make crisp, fluffy vada is to whisk the dal till it is light and airy. You can whisk the dal using an electric hand blender or manually. A continuous whisking of 10 – 15 is good enough to incorporate air in the dal. Add 2 – 3 tablespoon of water if the batter is too thick and then whisk. Add salt, chopped green chilli, onion, ginger, curry leaves, black pepper and spices in the dal. Mix nicely. Heat oil in a wide deep frying pan. To shape the vada, keep water in a small bowl next to the dal paste. Soak your fingers of both the hands in water and pinch a lemon size portion of dal paste. Hold it with your one hand fingers and flatten it using the other hand wet fingers. Make a hole in the centre of the flattened vada using your finger. Gently slip it on to the pan of hot oil to deep fry. For safety reasons, it is best to slide the shaped vada from the sides of the pan. Deep fry the vada over medium-high heat till they turn golden brown, crisp from both the sides. Transfer to a plate lined with kitchen towel. 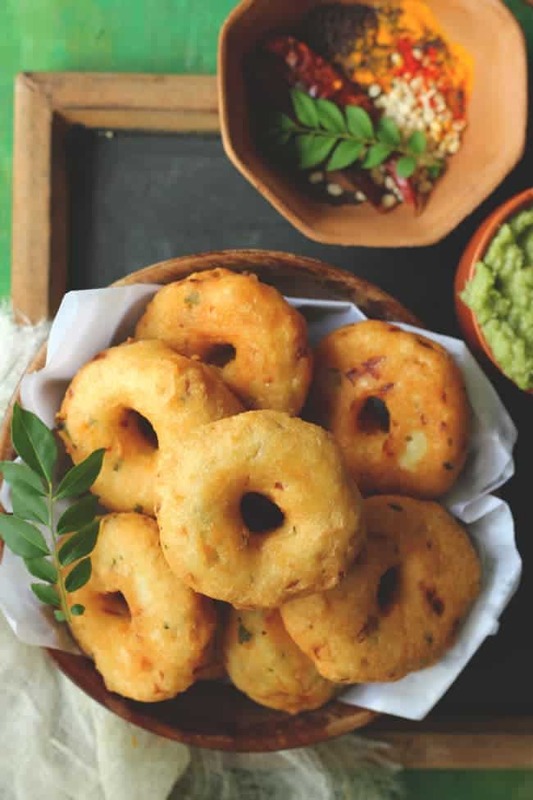 Serve Medu Vada warm with coconut chutney and sambar. This looks delicious!! …want to try this out! Can we use urad dal powder in case the dough become watery? Yes, you can surely add a tablespoon of urad dal powder to get the right consistency.